Around the central mixing table at the Savon de Saigon (180/58 Nguyen Huu Canh, Binh Thanh) laboratory, Julien and Thao gather the class together. 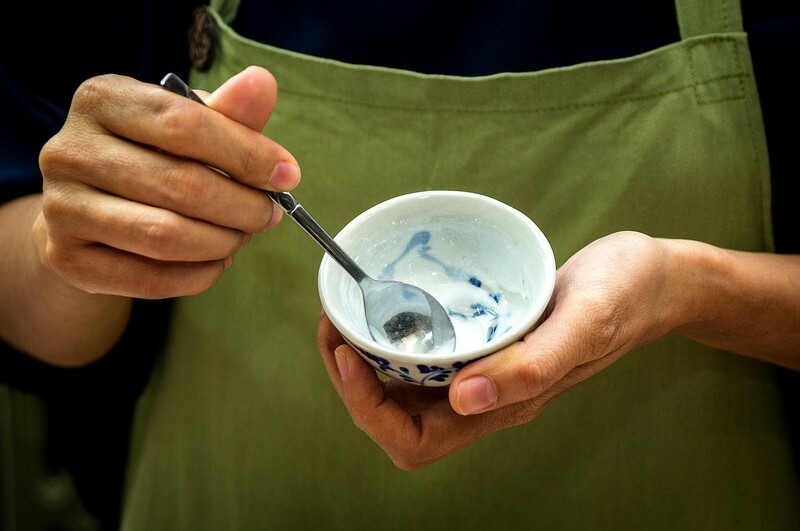 We had only two hours of class time and Julien Robellet, co-founder of Savon de Saigon, was determined to cram in at least two or three items for each of us to make. 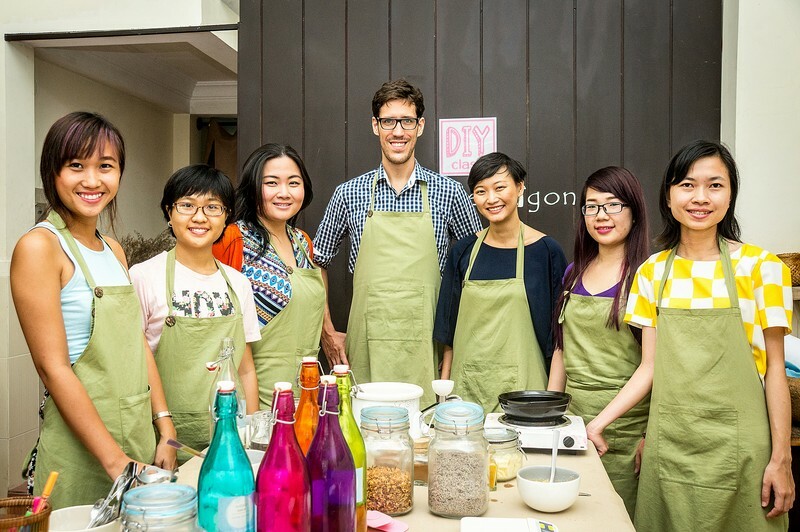 There were five of us in total and we were here to learn how to make different kinds of beauty products. Body lotion, skin serum and a scrub were on my to-do list while my classmates chose a combination of lotions, scrubs, lipsticks and soaps. We started out with the body lotion first because it needed some rest time before the final two steps. The basic two components that make a lotion are water and oil. Julien explained that Savon doesn’t stock body lotion in its lineup because, at best, natural lotion lasts for only about three to four weeks if properly refrigerated, so it wasn’t suitable for retail. He further elaborated that body lotions found in supermarkets are made of mostly water and preservatives, and some only contain ten percent oil – the main ingredient that provides the benefits. Julien walked us through the two types of oils: carrier (they have five to six varieties) and essential (the lab houses 25 different ones). The names of the carrier oils are buzzwords cosmetics companies like to name-drop like jojoba, argan, sweet almond and, of course the Vietnamese favorite, coconut oil. The essential oils are far more extensive. Julien handed out sheets with a brief summaries of each and their benefits, which oil combinations complement each other and ones to avoid if you have certain skin conditions. 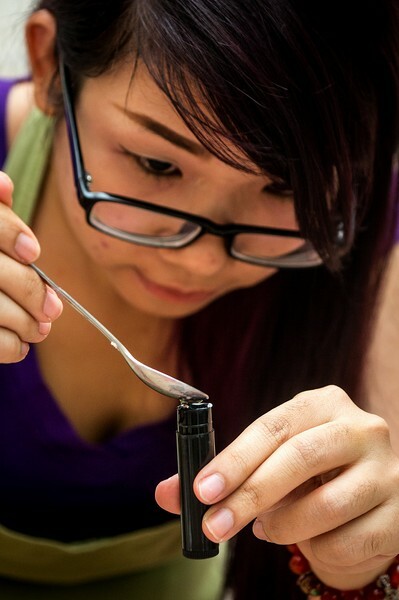 While I was busy experimenting like a mad scientist, Julien’s wife and co-founder Nguyen Thi Hong Thao coached the other students on how to make lipstick. “You mix up some shea butter and rose oil in a flask, add in some magic and extra ingredients and put it in a lipstick tube,” she said. 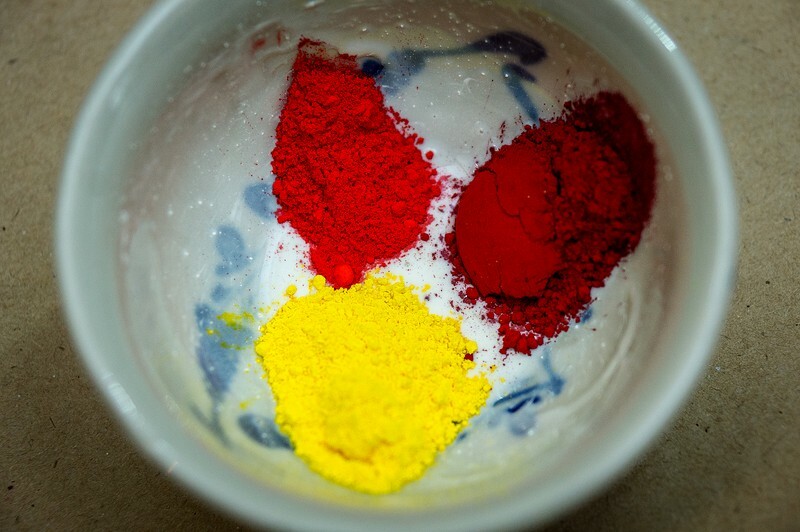 “It’s like cooking or baking, only much more fun.” A fairly simple process, just a base of butter, oil and food coloring — however, the color mixing process takes a lot of trial and error. It’s a little messy, but fun. Thao, who is a trained biochemist, also advised us on matching colors with skin tones. One student immediately went for a classic red while the other opted for pink. 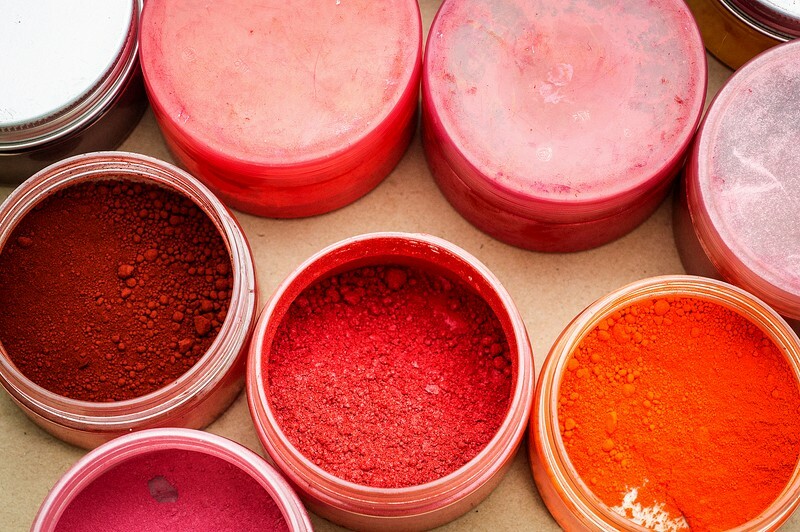 The red turned out to be a great success, being incredibly pigmented with a color that easily accentuated most skin tones. The pink one was a little trickier because it turns out that pink can easily wash out Asian skin tones with its cold, blue undertone. The pink lipstick took several tries where we mixed a color, tested it on our arms and lips and then remixed. Thao was surprisingly patient with the multiple remix attempts. Since the lipsticks were made out of shea butter and beeswax, the texture was smooth and creamy. If it weren’t for the short lasting time on your lips, I would say the handmade lipsticks we made in class could stand head-to-head with MAC lipsticks and the like. Next up on Julien’s part was the soap and skin serum. The skin serum is a tiny concoction of base oils, vitamin E oils and essential oils. Julien coached us on how to tailor the serum for our exact skin condition. Mine was made out of a base of sweet almond, vitamin E, argan, rosehip and joboba oils. Out of all the items on the class agenda, I was looking forward to this one the most. Beauty oil is a big international trend right now, and anyone who follows the news knows that the average bottle of beauty oil costs an exorbitant amount, especially if it comes from a brand name — for example a Josie Maran pure Argan oil costs USD48 for 1.7oz of oil. The soap making is where it got interesting. This is the only time in the class when Julien reached for a chemical. He explained that a bar of soap was a chemical reaction at its base, so there was no getting around that core chemical. Then he went on to explain that Savon’s chemical use in soap making is minimal. 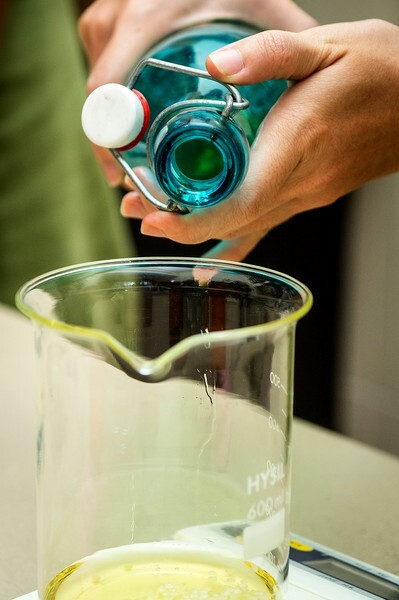 The chemical — sodium hydroxide — would evaporate after reacting with coconut oil, leaving only a trace amount in the soap. 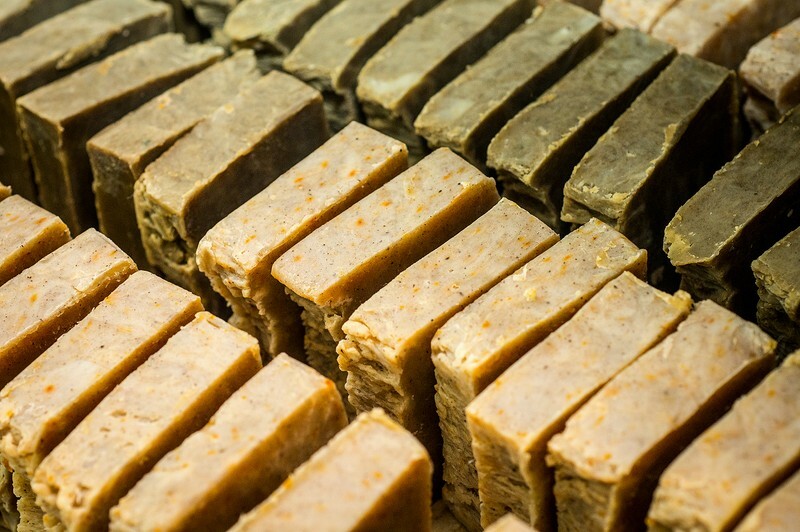 The soap bars we made were 99 percent natural and gentle enough that they could be used for cleansing the face. “The so-called ‘natural’ label on many personal care products sometimes doesn’t really mean what you think it means. ‘Natural’ is a vague descriptor. If you don’t work in chemistry, biochemistry or related fields, chances are you won’t be able to tell if some concoction is natural or not,” explained Thao. Last on the list were two varieties of scrubs: salt and coffee. The former was made using a simple mixture of salt plus essential oils, various powders such as green tea, and dried flowers. The coffee scrub had ground coffee added in and less salt. Out of all the items we made, the scrub is the one that will last the longest. 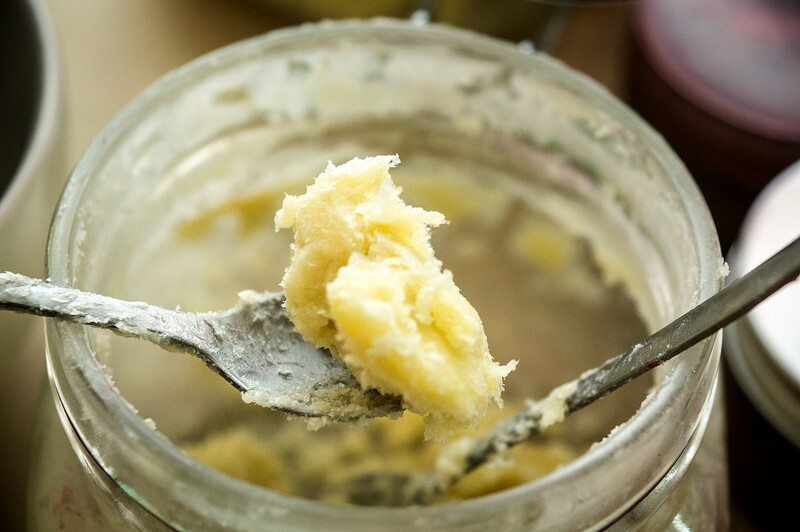 If properly kept, natural scrubs can last for a year. We didn’t get to learn how to make mineral makeup (foundation, bronzer) since that is an advanced class. It sounded fun though. Class instruction was very detailed and we received personal coaching from both teachers but they were also quite open when it came to our personal preferences and skin conditions.